I turned 49 about two weeks ago. It took a while for that to sink in. Honestly, I thought my life would look a lot different at 50 than it looks right now. I realize that a lot can change – I hope some of it does – in fifty weeks, so I’m not giving up! But this realization reminded me of a blog post I read several years ago about a woman who did something amazing for her birthday. She made the day about others instead of herself – 34 Random Acts of Kindness. I have wanted to do something like this ever since, but just never have. Birthday Challenge: 35 Acts of Kindness. One Day. I’m thrilled that this is no longer a new concept – I love that people are getting out of themselves and blessing others. Birthdays have always been kinda difficult for me. There’s always at least a small pity party that I throw for myself; and that’s NOT the kind of party one really wants on their birthday! So… since this is my 50th year, I’ve decided to celebrate people! My party and my gifts will last the entire year! But the party & gifts I’m talking about are going to be blessing others and the joy that these acts of kindness will bring to someone else. Here’s what I’m proposing: each week from now until my 50th birthday, I will commit to intentionally seek out something to do for at least one other person. I will try to take pictures and post them here. That is not for glory or for pats on the back; it’s for holding myself accountable, and it’s for inspiration. The people in the above posts have inspired me to start this project; and if I can inspire someone else to do something similar, then the chain keeps growing. And wouldn’t the world be a much better place if we were all just kind to each other? Now when I was thinking about this project – 50 Weeks til 50 – I was wondering how I’d be able to afford to do this. I’m a single parent struggling to put two teenagers through Catholic High schools and plan for college tuition! But I realized that none of these Acts of Kindness need to be expensive. I can operate on the KISS principle (Keep It Simple Sweetheart) and do as much or as little as my situation allows. But I also want to stretch myself; I shouldn’t take the easy way out by always doing something free or cheap. Therefore, over the course of the year (or 50 weeks), I will aim for a variety of ideas and types of things. Because I want this to be duplicable; I want someone to read these posts and be able to replicate them if they desire. Who will join me? Don’t worry if you find this post when I’m on week 17, just jump right in and get started. 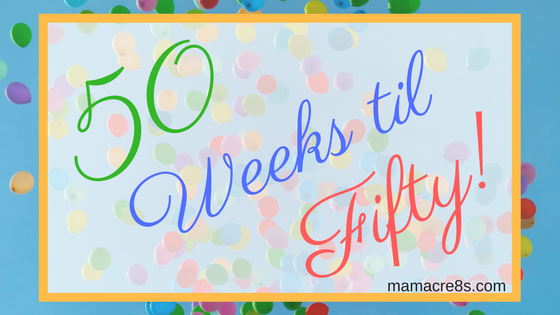 And if you do decide to participate in any way, you can tag me on twitter or IG (@mamacre8s) and use the hashtag #50WeeksTil50 – I’d love to see how you show kindness to others!